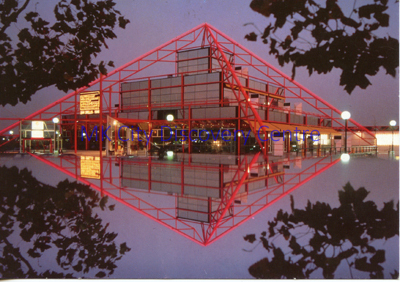 Postcard showing an evening view of The Point, Central Milton Keynes, framed by tree leaves. Image has been edited to appear as if the building has been reflected underneath. There are two postcards of different sizes, one is a slightly wider crop showing tree trunks at the side.